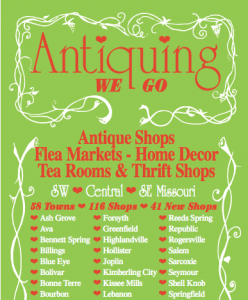 The “Antiquing We Go” brochure is 33 years old and is the must have directory and guide, that has detailed maps to over 100 Antique Shops, Flea Markets, Home Decor, Thrift Shops and Tea Rooms in Southwest, Central and Southeast Missouri. Each year the brochure is printed in a bright color. It includes detailed descriptions of each shop, mall and vintage store using hearts to point you to the stores front door. You can pick up a copy not only in the shops in the brochure, but they can also be found in Kansas City, St. Louis, Arkansas and Oklahoma shops. Click here to print out a PDF to take with you on your trip, or pick one up at a shop listed in the brochure.